After a couple blizzards, trudging around in snow, pretty at first, gets tiresome. 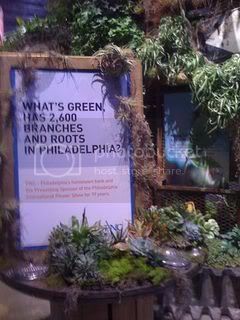 The recent Philadelphia International Flower Show reminded me that spring indeed will arrive. Another reason I attended the show was to check out the sponsorship activation. The Flower Show is one of the best sponsorship developers in Philadelphia, and I always appreciate the obvious guidance and hard work of their staff. PNC gets a round of applause from me for their dedication to Philadelphia's arts & cultural scene. The financial institution whole-heartedly supports important arts organizations and invests philanthropic dollars to nurture the passions of future arts and culture lovers. At the Flower Show, they benefitted from a strong association through their presenting status and did a good job tying philanthropic messages and business goals. At PNC Park, you could stock up on green. 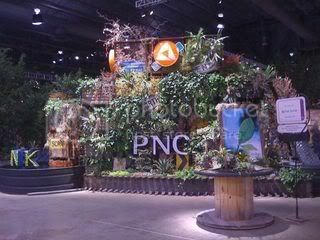 PNC tied a different green message into a floral and waterfall display, next to which event-goers could enter their votes for the People's Choice Award, plus get a free tote-bag. Knowing banks, I imagine (and hope) PNC is hosting customers with tickets to the show. Their display may have benefitted by more of a human touch, besides two young women handing out tote bags. The banking and financial industry still faces a cynical, distrustful consumer world out there. Banks would benefit from a human-centric approach to their marketing these days. However, all in all, a nice effort from PNC. 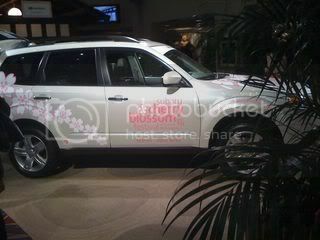 Subaru, also a major sponsor, was right in the middle of all the action and used the opportunity to promote another flower angle: their sponsorship of the Cherry Blossoms Festival here. 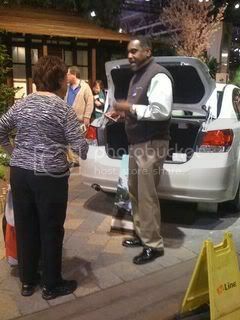 I overheard a snippet of this Subaru representative's conversation with this woman, telling her about Subaru's VIP program. Wise car salespeople love sponsorship because customers want to talk to them. I've long admired Discover Ireland's sponsorship strategy – to support golf and gardening events, to attract lovers of key attractions in Ireland – having worked with them at a PGA Merchandise Show where they sponsored an international travel area by PGA Magazine. I was disappointed at the Flower Show, however, to see what a missed opportunity their investment was. 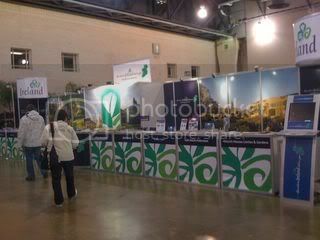 Discover Ireland sponsors a garden display, to promote their gardens and has a large booth, with vast real estate. But what do you notice? Need a closer look? Where's their staff? Why is no one taking advantage of this great opportunity to tell International Flower Show enthusiasts about a country with great gardens? Corporate readers, take note. Corporate sponsorship is all about the experience, the face-to-face opportunity your brand, your product, your staff, your service gets to have with audiences of the event or opportunity you partner with. Why spend all the money to invest in the sponsorship, to build a booth, create promotional value, and then not follow through? It would be like an Olympic skier getting all the way down the 2-mile run and slowing down at the finish line. Seize every moment of the sponsorship opportunity. Make it work for you. Don't waste your money. And definitely don't complain that your sponsorship investment "didn't work." The surprising Best of Show to me was Acme. I haven't visited Acme's retail locations yet to see how they activated in-store. 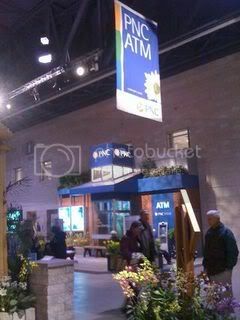 At the Show, Acme had a simple but attractive booth where they sold flowers. Simple, right? But wait. There's more. 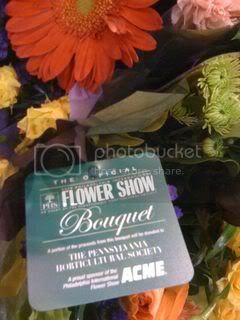 Among the bouquets Acme sold was the Official Flower Show Bouquet, with a portion of the proceeds benefitting the Philadelphia Horticulture Society and its programs – which, by the way, benefit all Philadelphians. The Unsung Hero of the Show is EB Henry. They, like many other businesses, could benefit from greater knowledge about how to really leverage sponsorship. EB Henry donated 3 truck-loads of hardscaping to the show, creating beautiful displays everywhere. All around the show, you experienced their products and handiwork. When I asked the EB Henry representative about their participation in the event, he quickly acknowledged valuing the partnership. All the materials are incorporated into gardens the Horticulture Society creates with partnering organizations throughout the city after the Flower Show. What a great story. However, I wondered if EB Henry maximizes their participation. The young man said they "hope people will start thinking about their gardens." With all the snow we've had, surely people are thinking about their gardens, I thought. But he didn't seem to have a strategy to engage Flower Show attendees, to track related sales, to encourage them to visit their showroom. At least he was there, eager and enthusiastic to talk about their products and humbly share a great story. Corporate sponsorship is a powerful medium. If your corporate brand is only using it to stick a logo on a banner or brochure, you're wasting your money. Take full advantage of every opportunity, and make sure you're doing your part in achieving a return on your investment. Gail Bower is President of Bower & Co. Consulting LLC, a firm that assists nonprofit organizations and event/festival producers with dramatically raising their visibility, revenue, and impact. Gail Bower is a professional consultant, writer, and speaker, with nearly 25 years of experience managing some of the country’s most important events, festivals, and sponsorships and implementing marketing programs for clients. Her blog is http://www.SponsorshipStrategist.com and you can see all of Gail's past posts here. The opinions expressed herein do not necessarily represent those of the publisher, SponsorPitch, LLC.